Abstract. The marine acid–base system is relatively well understood for oceanic waters. Its structure and functioning is less obvious for the coastal and shelf seas due to a number of regionally specific anomalies. In this review article we collect and integrate existing knowledge of the acid–base system in the Baltic Sea. Hydrographical and biogeochemical characteristics of the Baltic Sea, as manifested in horizontal and vertical salinity gradients, permanent stratification of the water column, eutrophication, high organic-matter concentrations and high anthropogenic pressure, make the acid–base system complex. 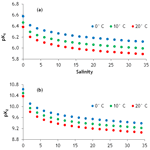 In this study, we summarize the general knowledge of the marine acid–base system as well as describe the peculiarities identified and reported for the Baltic Sea specifically. In this context we discuss issues such as dissociation constants in brackish water, different chemical alkalinity models including contributions by organic acid–base systems, long-term changes in total alkalinity, anomalies of borate alkalinity, and the acid–base effects of biomass production and mineralization. Finally, we identify research gaps and specify limitations concerning the Baltic Sea acid–base system. How to cite: Kuliński, K., Schneider, B., Szymczycha, B., and Stokowski, M.: Structure and functioning of the acid–base system in the Baltic Sea, Earth Syst. Dynam., 8, 1107-1120, https://doi.org/10.5194/esd-8-1107-2017, 2017. 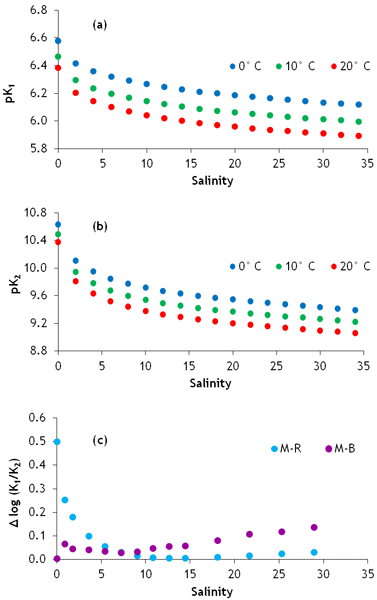 This review describes the general knowledge of the marine acid–base system as well as the peculiarities identified and reported for the Baltic Sea specifically. We discuss issues such as dissociation constants in the brackish water, the structure of the total alkalinity in the Baltic Sea, long-term changes in total alkalinity, and the acid–base effects of biomass production and mineralization. We identify research gaps and specify bottlenecks concerning the Baltic Sea acid–base system.